You’ve never seen a crab feast like this before. 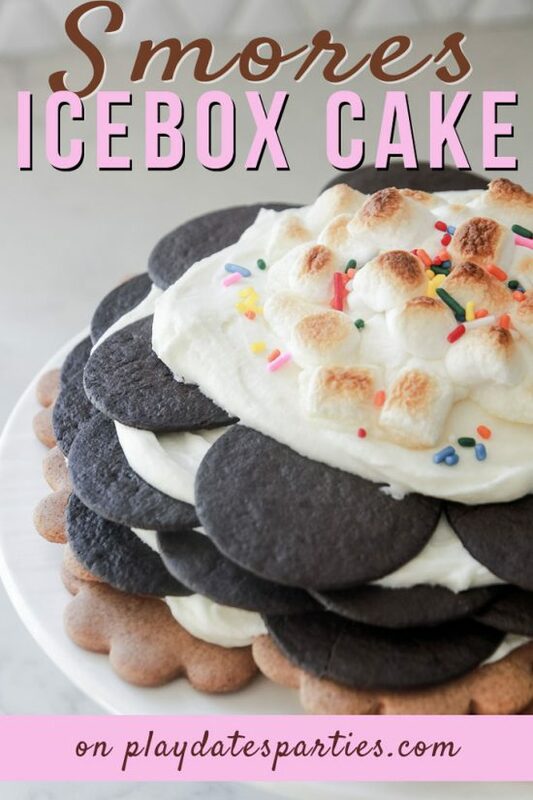 Take a look at this modern party with an easy party menu, fun nautical touches, and bright colors. Father’s Day is extra special at our house. It always falls within a few days of the Husband’s birthday…and his brother’s birthday. But Father’s Day also falls during a very special season for us Marylanders…crab season! There’s just something special about gathering together with family for a crab feast. Even when I lived in Virginia, summer wasn’t complete without at least one day picking crabs and gabbing around the table. So, when I asked the Husband what he wanted to celebrate this special day, he didn’t hesitate at all. He wanted a crab feast! BUT, crab feasts can be so messy. So, I took on the challenge of creating a crab feast that is both pretty and practical. Let’s take a look at how we made that happen, shall we? The crabs themselves were served out of a crabbing basket, and the rest of the food was served in natural half-peck bushel baskets and mini picnic woven baskets. Of course, Maryland blue crabs come straight from the bay, so I thought it would be a fun idea to add some nautical touches to our decorations as well. It all started with twine and rope. Braiding together large gauge twine was a fun alternative to streamers and ribbons. 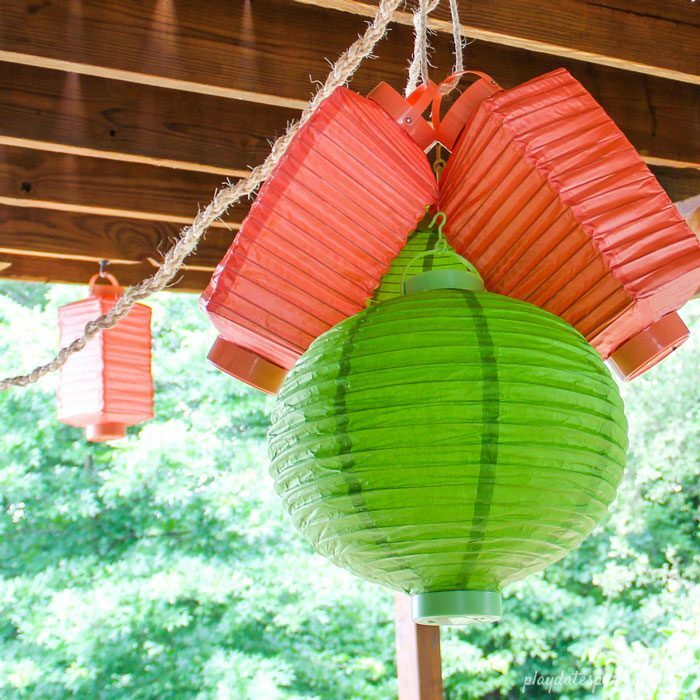 And it came in quite handy in creating the chandelier made out of battery operated paper lanterns in the party’s green and orange color scheme. Most crab feasts include a bunch of newspaper or trash bags spread over the table to collect muck and gunk. But I wanted something better. I needed to find a way to protect the table, while being durable enough to handle the pounding that comes with cracking crabs. My homemade mess-proof book page tablecloth was the perfect solution! It’s fun to look at, and is wipeable too. 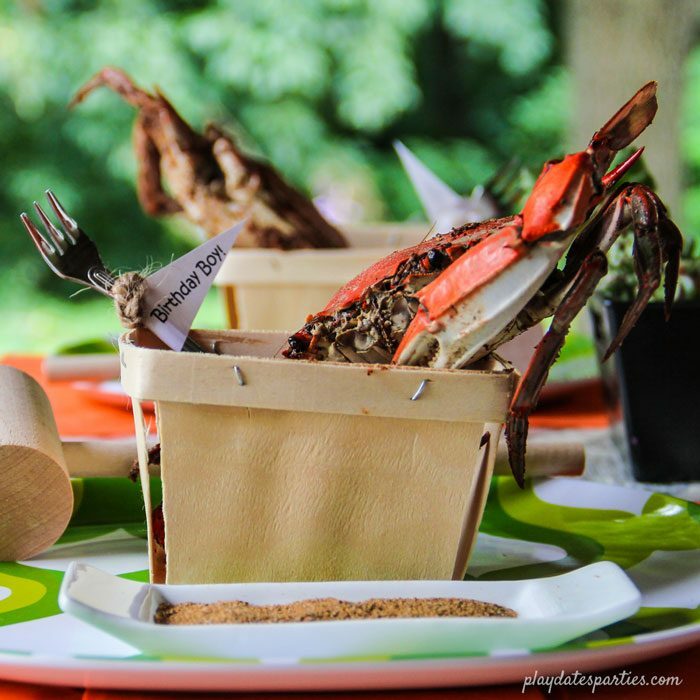 The place settings also had a berry basket for collecting crab shells, a mallet, and individual trays of Old Bay seasoning. The berry baskets were even prepared with a steamed crab, and a cocktail fork. I just love the little party flags and twine accents on the cocktail forks, don’t you? 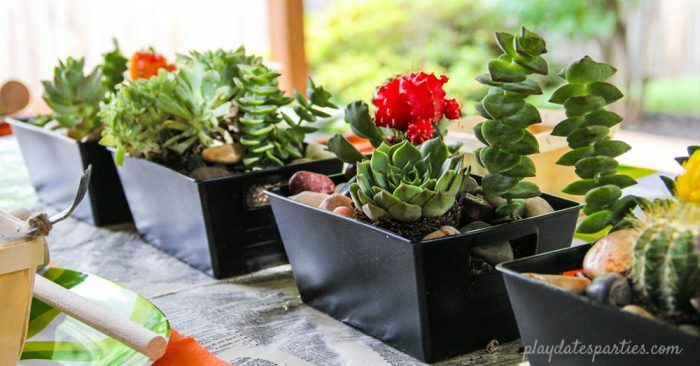 Instead of a big fussy centerpiece, I opted for making a quadruplet of succulent planters. The greens, reds and oranges worked perfectly with the decor. And they provided a nice pop of color without being too feminine. 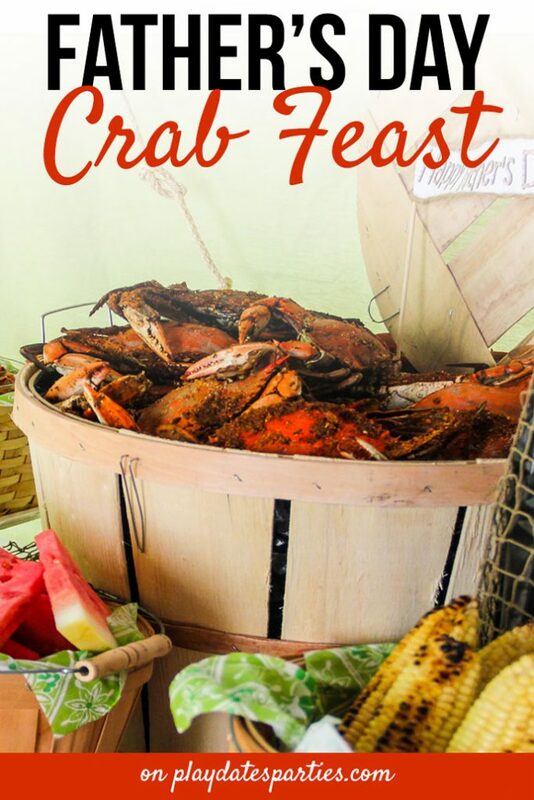 Yes, we Marylanders love our crab feasts, which made it the perfect way to celebrate Father’s Day and my Husband’s birthday. But you can have a crab feast anytime during the summer! It’s a fantastic way to just sit and spend time together doing something fun. And even though it’s a messy endeavor, you can still make it look nice for a special occasion. All it takes is a little bit of creativity. 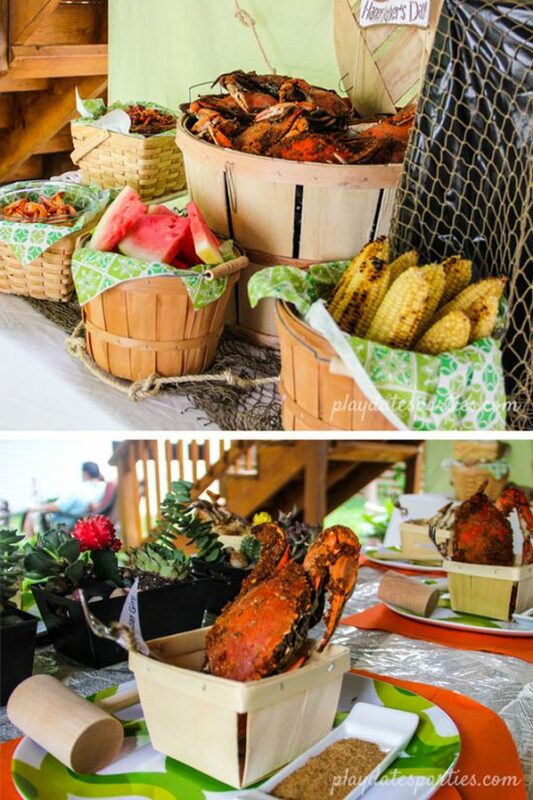 Have you ever hosted a crab feast? What’s the messiest party theme you ever hosted? You did it again! Made another party beautiful and tasty. It looks like so much fun too. How fun is that! And the menu sounds delicious! I found you at TT&J.. I am your newest follower, I can't wait for the Death by Chocolate! What a cute party! Your tablescape looks great and I love the newspaper and placemats. You really pulled everything off nicely!! That looks like an awesome party! I love the little baskets that the crabs are in on the table! 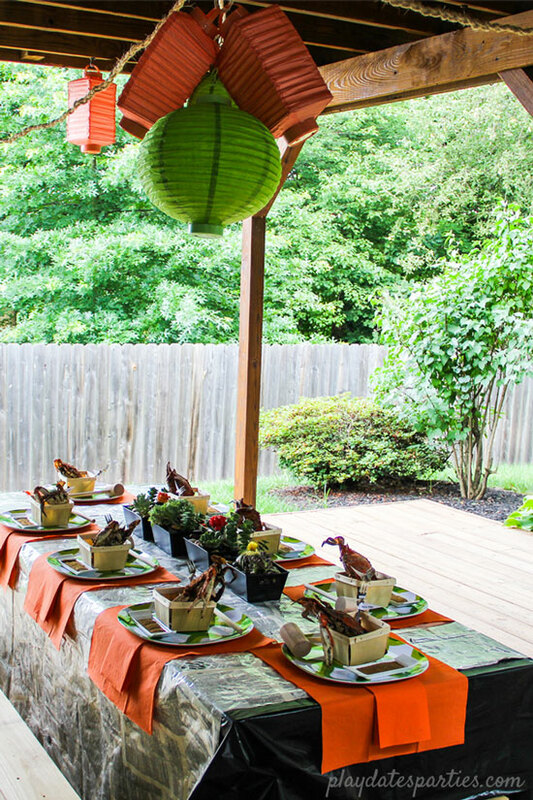 What a great looking party … love the colors and I love the little baskets. Very nice! Awesome theme decor! Making me hungry just looking at your spread! That's so cool!!! I can't believe you did that all!! Very professional and creative! Beautiful party. I am not really a decorator and can't imagine having such detail in a party and working full time and blogging. Amazing. And I want to come to a crab party. I didn't check, but I bet you don't live in Michigan! Great Party and you have a lovely outdoor living space. Real curious about the summer stew. Wow! What a fun party! 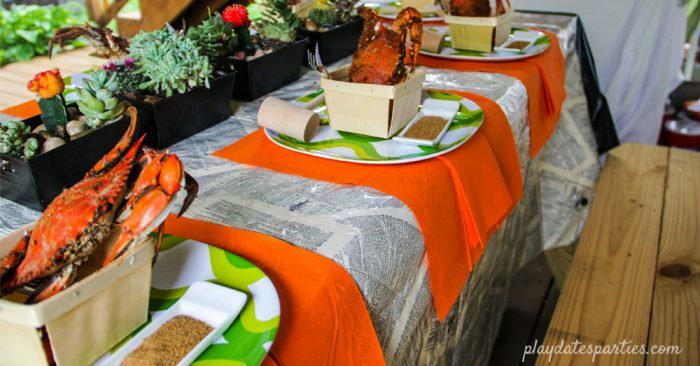 I love the book page table cloth … a fun party idea! I'm totally calling you on my next birthday. I love crab! I haven't had it in forever. Miss it. Looks great! This is impressive, I'm sure yout husband loved his birthday! Wow…everything looks so great! I love it! I don’t eat crab but the guys in my life would love this. Thank you for sharing with us this week at Celebrate Your Story, and I hope your week is going great. Looks like my kind of party. I love crabs. Thanks for sharing this wonderful idea on Sunday’s Best. Some of my favorite memories as a child were catching crabs out of the Potomac and eating them within an hour of dipping them out of the water in our nets. We would go down to a bridge at night as the tide was turning and hang a lantern. When the crabs swam by we’d scoop them up in a chicken wire net. We also did it the old fashioned way with a chicken neck on a string. My father taught us how to pick crabs when we were toddlers. We learned how by cracking the claws and worked our way up to the body. My mother disliked any kind of shellfish and crabs in particular and would avoid kissing us before we washed up and brushed our teeth. Your crab feast looks lovely! Thanks for bringing back the memories.